Globally, there are 17 nations where the rate of lawful gun ownership exceeds 25 firearms per 100 in population. 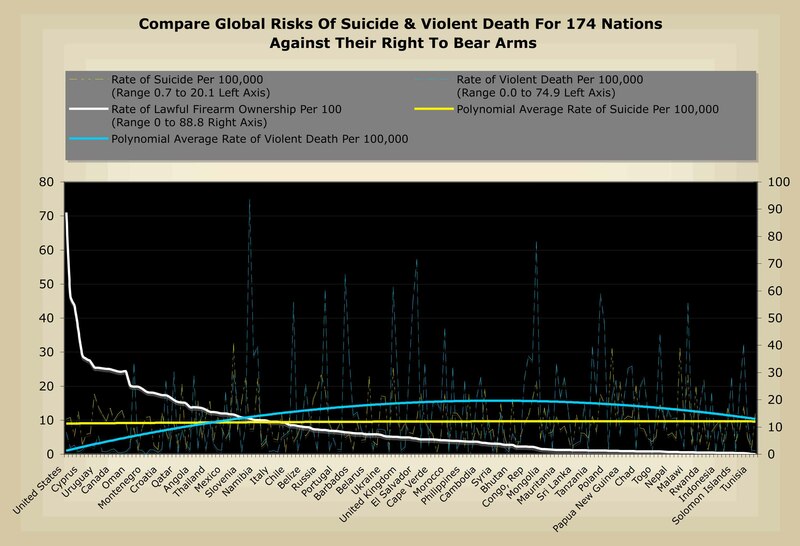 The average rate of violent death and suicide in these countries is 2.2 per 100,000 and 9.9 per 100,000 respectively. The U.S. rates are 6.4 and 10.3 respectively. For “disarmed” nations, those below 25 lawfully owned firearms per 100 in population, the average risk of violent death rises six fold to 13.1 per 100,000, while suicides remain flat at 9.4 per 100,000. The presence of lawfully owned firearms in any given society appears to have a chilling effect on overall violence while having no effect on that society’s suicide rates. America’s Founding Fathers were right.